The Macchi M.6 was an Italian flying boat fighter prototype of 1917. In 1917, Nieuport-Macchi built the M.6. 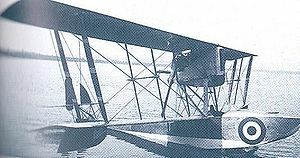 for comparison with its Macchi M.5 flying boat fighter, which went into service that year and operated successfully over the Adriatic Sea against Austro-Hungarian forces during World War I. The M.6 was identical to the M.5 in most respects; like the M.5, it was a single-seat wooden biplane flying boat fighter with plywood and fabric skin, it was powered by a 139-kilowatt (187-brake horsepower) Isotta-Fraschini V.4B engine mounted on struts above the hull and below the upper wing and driving a pusher propeller, its cockpit was beneath the radiator, it was armed with a single 7.7-millimeter (0.303-inch) Vickers machine gun, and its hull was of the same design. It differed from the M.5 in having a different wing cellule; instead of the interplane Vee struts used in the M.5 to brace the wings and the smaller Vee struts used in the M.5 to support the overhanging leading edge of the upper wing, the M.6 had parallel steel tube struts. The outermost of set of parallel struts were placed farther outboard in the M.6 than the Vee struts in the M.5, and the M.6 had additional parallel struts closer to the hull. Comparative trials were held between the M.6 prototype and standard M.5 aircraft to evaluate whether the M.6's revised wing cellule provided any advantage over the that of the M.5 fighter. It did not, so further development of the M.6 was abandoned and no more M.6 aircraft were built. Macchi M.6 Pictures and Macchi M.6 for Sale.